Update: we've added a unique always on setup, for our TV hardware. With our equipment, and fast setup below, you can set up a TV portal in minutes. Walk into any office and the chances are high you’ll see a TV. It’s simple to order one online, or pick one up at store. It’s affordable. We want to make it just as easy to set up video conferencing — and wireless presentations and always on video portals — on your office TV. While many of our users find us through our free computer calls and easy integrations with tools like Slack, Google Calendar, and Intercom Messenger, our goal is to make video calling accessible whatever screen you’re on. Definitely, as video becomes more important, it should be convenient. 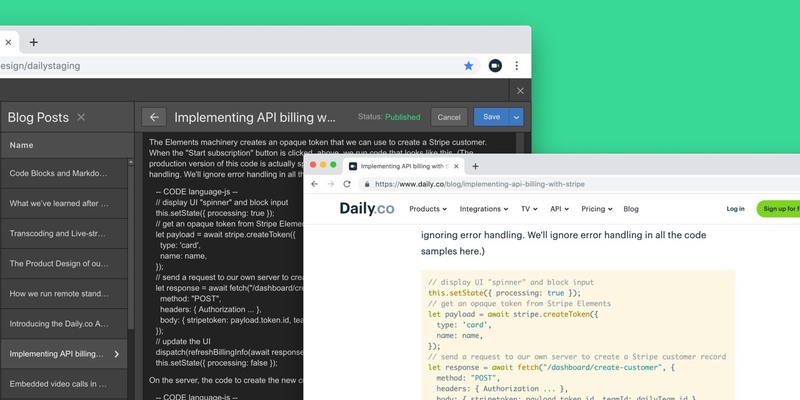 We really enjoy building the free software — it’s fun to support that freedom and flexibility, where you can right now click and set up a team, or your own URL, in seconds. Setting up hardware should be convenient, too. 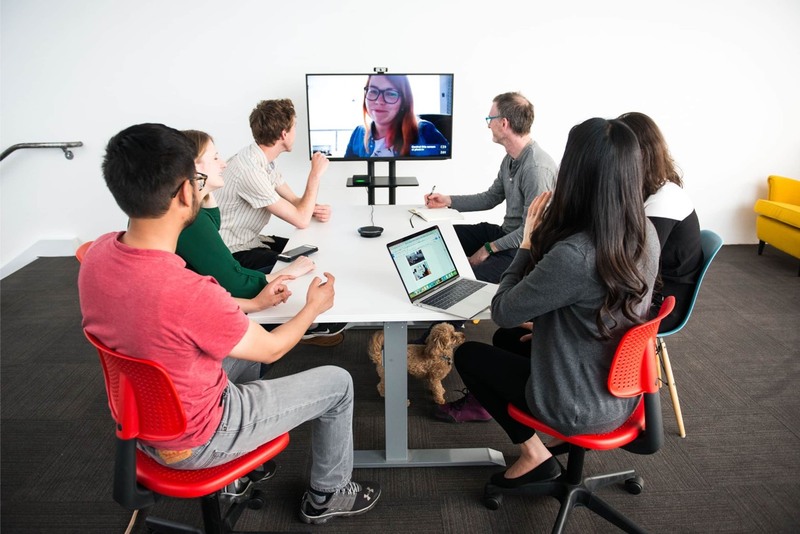 When we first started designing video conferencing (many moons ago), we built systems for Fortune 100 companies. As rewarding as that was building big systems, some of the most compelling and creative people we knew were starting small, to build something new. 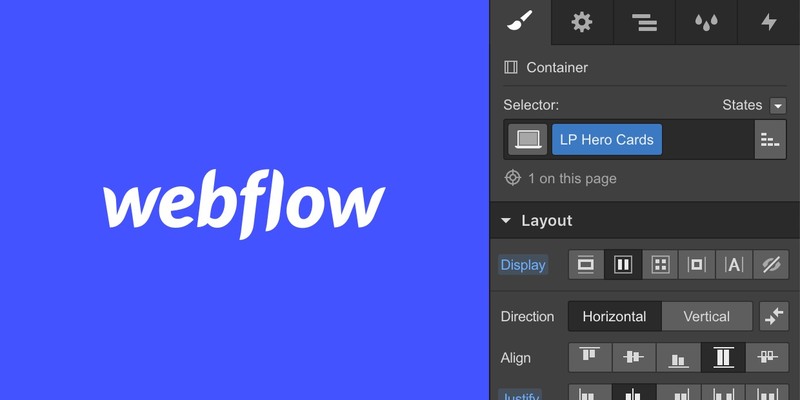 Creatives, startup founders, nonprofits, SMBs — they were developing new things in small teams. 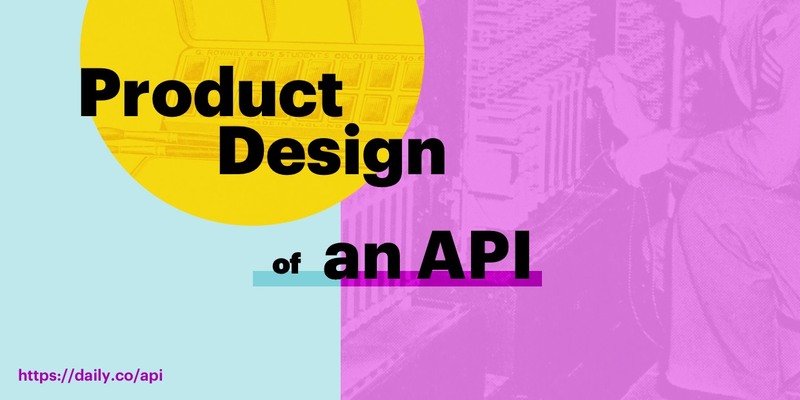 Our goal was to build dedicated hardware for the creative and growing teams, who were smart about how they wanted to use tech, but weren’t necessarily technical themselves. Also, time is valuable. If you’re hassling with IT, or cables, you’re not working on your core problem, or your creative passion. So we designed Daily.co TV, a plug-n-play package, for video calls on a TV. Sourcing. It’s everything you need in one package. With other hardware systems, you buy the hardware yourself. That can be a great choice. We also wanted to take care of the vetting, for those customers who wanted an efficient, vetted process. Buying. You can just buy it online, and try it out in your own workspace with our free trial. You don’t have to do a demo or talk to a salesperson. Setup. Anyone can connect the equipment, in minutes. We send you everything you need, in one package, for video calls on your TV. By the way, we rebranded a few months ago...after our working with our amazing photographer Kristin. We're now known as Daily.co; back then we were Pluot. Different name, but same company and same product! To learn about the equipment and purchase, check out the resources at our website. Our help center also has detailed information, like what comes with an order, Ethernet and other requirements, and pricing and free trial details. The color coded cables make setting up your hardware system easy. Of course, ping us anytime for help. We love talking to customers. Having said that, most people set it up themselves. When you unbox your order, you’ll see something like this guide inside your box. 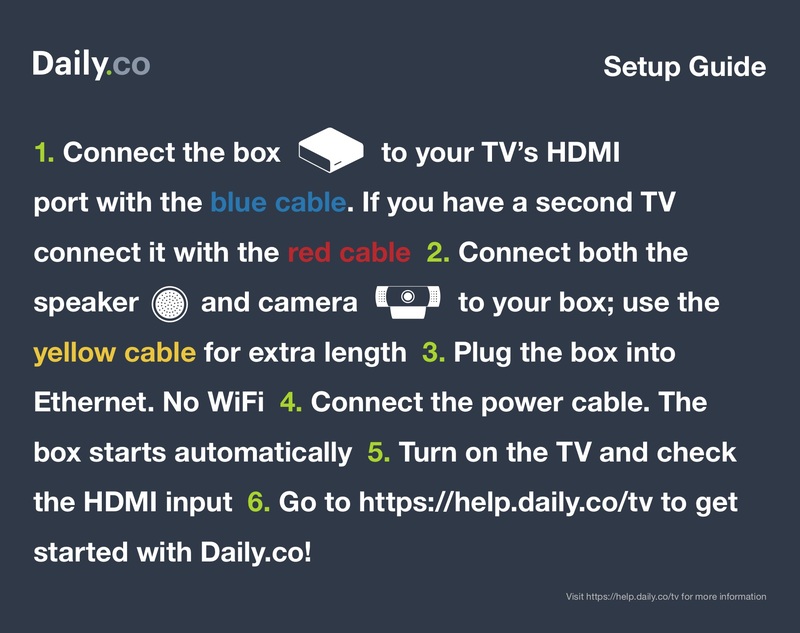 Connect your TV + Daily.co device. Use the blue cable. Plug one end into that small device, and the other into an HDMI input on your TV. Want 2-TV video conferencing? 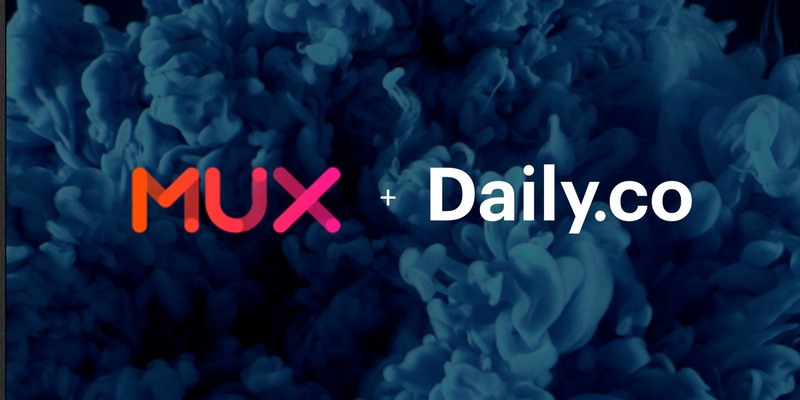 If you like, Daily.co hardware lets you connect a second TV. (No worries if you’re on 1 TV). Use the red cable. Plug one end into the device, the other into an HDMI input on TV #2. Connect your speaker/mic + Daily.co device. Use the yellow cable. It’s 15’ long, so you can move your mic around your table. Plug one end into the device, the other into the speaker/mic. Ditto camera + device. Place your camera on top of your TV. (The camera base unfolds to fit over the top edge of almost any size TV.) The camera has an attached cable. Just plug that into Pluot. Pluot + power. Plug the power supply into an outlet. The other end of that power cord connects to Pluot. Turn on your TV. Remember your HDMI input on TV1? Go to that HDMI screen on your TV. Turn on Pluot. You got it. That’s it, you’re done. Congrats! You’ve got a video conferencing system. Your Daily.co TV has powerful features like unlimited free dial-in, recording, wireless presentations, and dual screen sharing. What's great is while you have a TV, you can talk to anyone on a computer or phone dial-in. 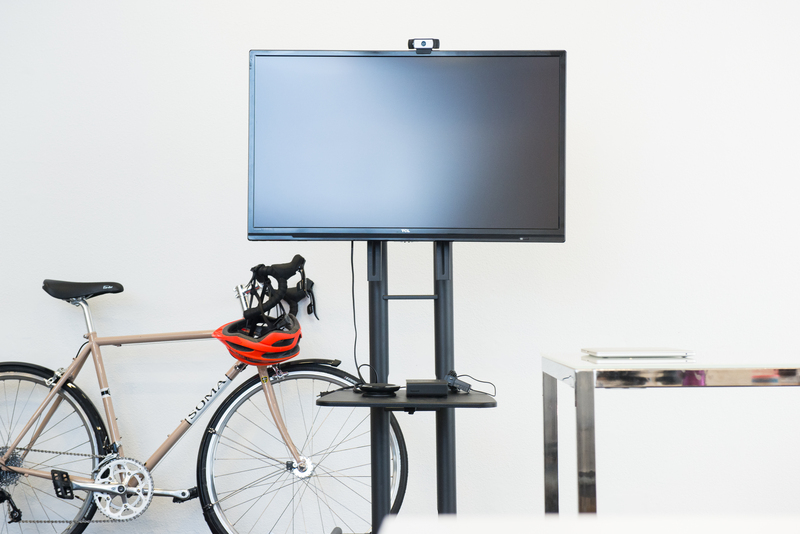 Your guests don't need a TV or our hardware, and it's free for them (and up to 50 people) to join your meetings. Our customers, as we said, do amazing stuff. It’s wonderful to help them get set up, work even more effectively, and connect with colleagues and clients anywhere in the world. When she's not writing about the changing nature of work, Elizabeth is hiking, probably in Marin County.